ARE YOU IN NEED OF LEGAL ASSISTANCE? --- ALERT -- CHECK OUT MY ARTICLE PUBLISHED BY THE HIGHLY REGARDED realclearpolitics.com WEBSITE. Click on "Articles" on the Left to Access. 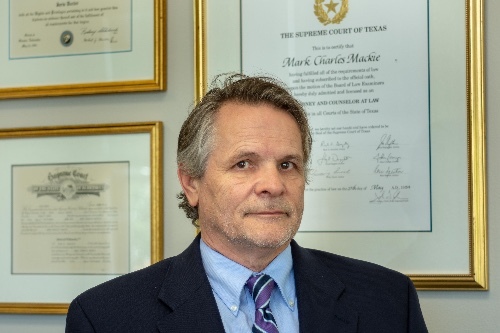 Businesses and individuals that turn to The Mackie Law Firm, PLLC for representation engage an attorney at reasonable costs with experiences unique in North Texas. Mr. Mackie’s private practice encompasses general business and commercial law, including litigation. The practice has an emphasis on business formation, debt collections, construction law, real estate, and asset protection. He also assists with governmental contracts including businesses selling to the federal government as well as health care law and physician practice management including billing and collection matters. Mr. Mackie has worked at the highest levels of the federal government as both a lawyer and policy advisor. He served as Chief Counsel for the U.S. Senate Committee on Rules and advised members on matters before the powerful Ways and Means Committee in the U.S. House of Representatives. His public policy responsibilities included issues such as national defense, judiciary matters including constitutional law, banking and monetary policies, federal election law, and protecting the commercial business interests of the Senate. He has advised some of most senior members of Congress including Senate Party Leaders. Regardless of the issue, clients receive personal service from an approachable attorney with broad experience who works for their interests and does so without crippling their bank account. He is open to innovative fee arrangements. Lawyers, Mr. Mackie is also available to appear at hearings on short notice in Dallas, Tarrant, Denton, Collins and surrrounding counties. The Mackie Law Firm is located in Denton County, Texas, but also serves businesses and individuals in Tarrant, Dallas and Collin counties. Most clients are in Flower Mound, Lewisville, Highland Village, Denton, Frisco, McKinney, Carrollton, Coppell, Grapevine, Euless, North Richland Hills, Arlington, Irving, Dallas, and Fort Worth. Unless noted, the Texas Board of Legal Specialization has not certified any attorney on this site. Information you obtain at this site is not, nor is it intended to be, legal advice.